From one series first to another, The Great British Baking Show is ramping up and delivering one hell of a mid-season run. First Ryan had his remarkable turnaround in “Pies,” going from barely escaping elimination in “Desserts” to Star Baker one week later. The very next episode, in another Baking Show first, no one is eliminated. The judges are explicit that this reprieve will only last one episode and that two will be going home next time, but after growing fond of all of these bakers and watching their dramatic ups and downs these past few installments, it’s a relief to not have to say goodbye to anyone. The twist ending of “Puddings” would be a welcome surprise in just about any episode, but the producers and editors make a lot of smart choices to ensure viewers are particularly invested in the results of these bakes, and particularly elated that, just this once, everybody lives (to bake another day). After some classic Mel and Sue banter, “Puddings” dives right in with the signature challenge: The bakers must make six each of two different sponges, each with their own sauce. It’s a straightforward brief, but one that leaves plenty of space for the bakers to experiment and show off their flavors. This seems like it should be a fairly routine challenge, but perhaps due to time management problems or multitasking issues, no one knocks it out of the park. Dry, slightly overdone bakes are a consistent problem and most of the bakers get strong marks for one of their puddings and negative critiques for the other. 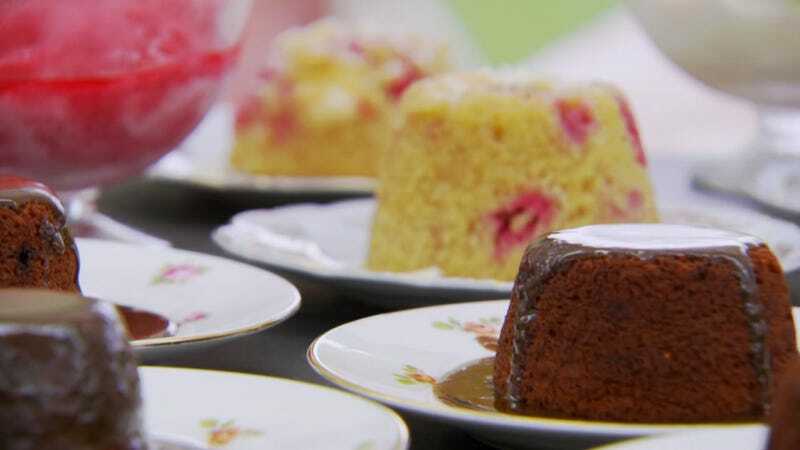 It’s a rarity on Baking Show, but Paul and Mary split on a couple bakes, Mary defending Cathryn’s puddings to Paul and Paul standing up for Sarah-Jane’s sticky toffee pudding. It’s fun to see these usually in-sync judges spar a bit and both this and the end-of-episode bickering between Paul and Mary over Danny’s puddings is particularly entertaining. Heading into the technical, the mood is tense. Danny is relieved the judges weren’t harsher on her for dropping two of her puddings on the floor, but no one received purely positive comments. Usually there’s at least one baker breathing easy at this point, recharged from some well-earned praise. There’s no such relief this episode. For the technical challenge, the bakers are tasked with making the Queen of Puddings, a tiered dessert with a layer of custard topped by a layer of homemade jam, and finished with a crispy, marshmallowy meringue. As in the signature bake, the brief seems fairly straightforward, but as Sarah-Jane describes, it’s actually a surprisingly tricky one. First the bakers need to make sure their custard comes together just right, then they need to gauge the precise thickness of the jam so that it’ll spread evenly over the custard without sinking into it (but also without being too runny), and lastly they need to make sure their meringue comes together with beautiful stiff peaks and absolutely no weeping. The clear baking dishes the judges have provided leave little room for error- the bright jam is stark between the light custard and meringue, a distinct band that must be even all the way around the dish, and any weeping meringues will leave the unsightly yellowish tinge of raw egg whites between the rich red of the jam and white of the meringue. The Queen of Puddings is a smart choice of technical challenge, but the execution of the segment on a production level is even better. The cameras catch many of the bakers thinking out loud, capturing the feeling of being in the kitchen with these bakers as they puzzle out a half-remembered recipe. It’s exciting to watch them use their expertise and to see how each baker responds differently to the challenges they’ve all identified. In a few cases, we even get to see different bakers reach the same fork in the road, respond differently, and then find out from the judges whose approach worked best. It’s an engaging and educational technical, and one made much more accessible due to the creative team’s smart editing and producing choices. After the first two rounds, Brendan is in good position and the judges scrap over Danny, who Mary also feels is in contention for Star Baker. James, Ryan, John, and Sarah-Jane are all in trouble and potentially up for elimination, so once again, it seems the result will be down to how the contestants execute their showstoppers. You can tell the showstopper challenge, to bake a sweet or savory strudel, is going to be a beast from the gleam in Mary’s eyes. She all but cackles when discussing it, and this is definitely the most fired up Mary’s been for a challenge this season. Even the great Mary Berry confesses she doesn’t bother making her own strudel pastry, as it’s such a tricky and delicate task, so this promises to be an exciting bake. The voice over walks viewers through the pitfalls of strudel and the bakers get to work, discussing how they plan to work and stretch their pastry. For once, Paul gives a demonstration, showing Sarah-Jane his preferred flick method to work the dough and build up the gluten. James is unimpressed, however, preferring the mixer over Paul’s more traditional approach. When Cathryn tries out Paul’s dough flick, at Sarah-Jane’s urging, she winds up flinging her dough onto the ground, so point James? Someone could probably figure out a way to fling dough out of a mixing bowl, but it would take a concerted effort. After the strained and stressful first two bakes, Cathryn’s all-too-human mishap is a wonderful break in the tension. Sarah-Jane and Danny rush to console and help her, all but crying “Five second rule!,” but Cathryn insists on starting over. “I’m not serving Mary Berry green carpet!” Her reaction, forlorn but determined, shows why she’s become a fan favorite. Many bakers would shut down at such a setback, but Cathryn lets herself feel the full weight of what’s happened, then picks herself up and moves on. Cathryn isn’t the only baker having a bad day. John nicks his finger early in the bake and quickly cleans the wound, grabs a rubber glove, and moves on. With the glove on and his head entirely in his strudel, though, he doesn’t notice how deep the wound is and when he goes to check on it later, it’s still oozing blood and his entire hand is stained crime-scene red. It’s ridiculous. If this were a scripted show, the images of John’s discolored hand, red right down to the wrist, where the glove stops, would seem campy and over the top. Danny hurries to help once again—it’s good news for John and the producers that there’s a doctor right in the tent—and keeps John’s hand elevated while the producers call over their medical team to assess whether he’ll be able to continue. In a less hands-on challenge, he’d likely be fine, but this is strudel. He’ll need to roll out and hand-stretch his dough, and aside from the ick factor of bleeding on your dough through your rubber gloves, as he likely would have, the doctors advise that he shouldn’t use his finger until he’s gotten it more properly looked at, and perhaps gotten stitches. John is devastated, certain he’ll be eliminated based on his first two bakes and inability to finish the third, and this leaves the judges in an unusual position. Brendan wins Star Baker again, for his beautiful and well-executed spinach, cheese, and walnut strudel with lattice topper, but the question of who to eliminate is tricky. This is not a case of a baker refusing to finish or present a bake, this is a temporary physical impairment stopping a baker from competing. Their decision, to mulligan the week entirely and have a double elimination next episode, is the right call and sets a wise precedent. It also makes for particularly entertaining television without feeling manipulative or manufactured and paints the judges as benevolent and the show as kind. As Sarah-Jane remarks, this episode is a roller coaster, one steered into rather dramatically by the producers. Yes, it makes for an engaging installment, but it’s not something the show can necessarily sustain. Once in a while, though, a little excitement can be fun, and with a double elimination next episode, we’re due just a bit more before the show returns to its usual steady and satisfying rhythms. As an American viewer, it’s interesting to see how the show classifies different baked goods. No one baked anything close to the most stereotypical of American pies, apple pie, for the previous episode’s “American” pie challenge and none of the bakes in “Pudding” are what most Americans would identify as pudding (basically, custard). The series was of course made with a British audience in mind, but for the confused Americans in the PBS viewership, a quick Mel and Sue explainer on dessert versus tart versus pudding versus pastry would be helpful. I’m 100 percent Team Ryan about his signature bake. The judges were definitely looking for his pudding to taste different- if the bake is required to be sauced, tasting it without the sauce, to help ferret out a potential aftertaste, is cheating. “Pudding” is one hell of an episode for Danny, and hopefully Paul will start giving her her due soon. Two great Mel moments this episode: Mel as emotional support host to Danny and her banter with John. Brendan is indeed The Bakingator. What will it take to bring him down? Some of Paul’s behavior this episode carries the whiff of sexism. Why the surprise when Cathryn presents her signature bake? “These look impressive, actually.” Stopped being surprised that Cathryn knows what she’s doing. And while Sarah-Jane may have wound up appreciating the strudel dough demonstration, he seems too comfortable taking over her work station for my taste.